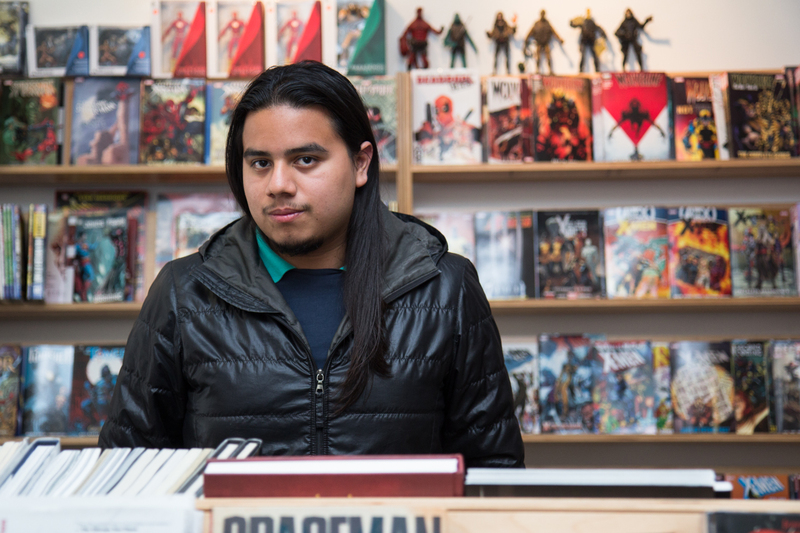 Daniel Parada, at the store Mission: Comics & Art, one of the first places where he distributed his work. Liz Mayorga had been interested in cartoons since she was a child, but it wasn’t until her last semester in college that she read the comics that changed her life. She was a senior at UC Berkeley when her Chicano Studies professor recommended a comic book series by Jaime Hernandez, “Locas,” with punk-rock stories populated by quirky young Chicanas. “I had always drawn, I always wrote, but I didn’t think about making comic books until found one that really spoke to me,” she said. “I was scared at first. I thought I was going to be bad at it,” Mayorga said. “But I had to get over it.” She is now the co-director of SF Zine Fest and will be among a number of local artists who are exhibiting at the Latino Comics Expo that takes place this weekend at the Cartoon Art Museum in San Francisco. 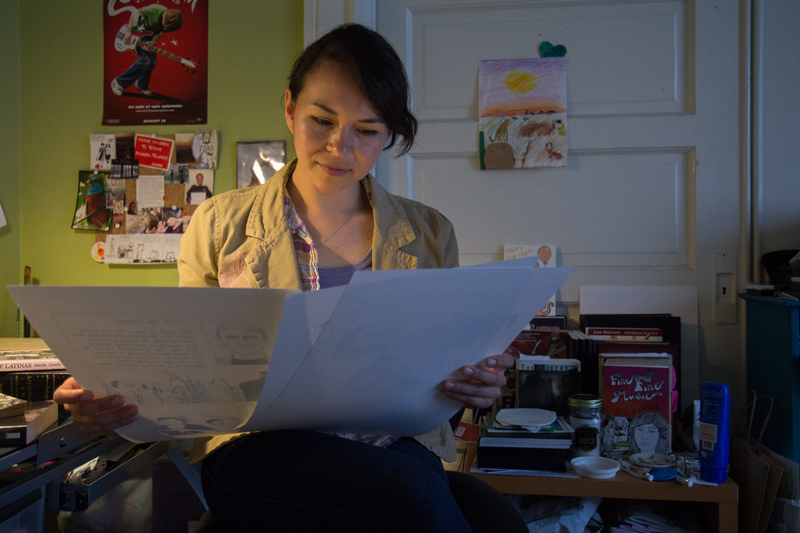 Liz Mayorga looks at pages of “Monstrous Love Stories” in her apartment in the Mission. Mayorga, 31, grew up in southeastern Los Angeles, with two older brothers. Her parents came from a small town in the Mexican state of Zacatecas and always wanted their children to stay connected with their home country. She moved to the Bay Area for college, and now lives and works in a book-filled bedroom in an apartment on 14th Street in the Mission. Mayorga’s zines include “Outgrowing Plastic Dolls,” based on lessons from her grandmother about DIY art, “Inked,” in which she narrates the experience of revisiting, as a tatooed woman, her family’s traditional Mexican roots, and “Monstrous Love Stories,” which combines horror with romance. Mayorga has penned some autobiographical work, but she says her heart is in fiction. Mayorga’s influences range from pop culture and the 1960s science fiction television series, “The Twilight Zone,” to horror films, her Mexican culture and Catholic background. And, even in the zines she has made where the cultural aspects are less noticeable, her identity as chicana always comes through, she said. Her book “Monstrous Love Stories,” for example, features iconography from 1950s Mexican films. Another artist who his showing work at this weekend’s Expo is Mission native Daniel Parada. From his family home on 24th Street, Parada is currently working on the second issue of his series “Zotz,” a story set in a fictionalized 16th century Mesoamerica in which the Spaniards never fully prevail. 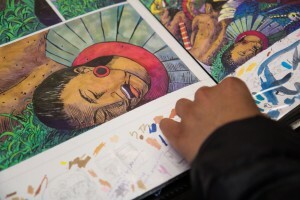 Parada said that working on his comic books has strengthened his interest in El Salvador. “I’ve been there a few times and I always feel a bit sad when I leave, but I wouldn’t say I had a strong connection until I started working on this series,” he said. Both Parada and Mayorga self-publish their comic book art in San Francisco. They will discuss the in’s and out’s of self-publishing at the Expo today. This year, the Expo is dedicated to the memory of underground cartoonist Spain Rodriguez, who participated in the 2012 Expo and died last year. Marta came from Zaragoza, Spain to master her English but everyone she speaks to wants to practice Spanish. After just a few months in the Mission, she already feels at home. In her free time she can be found reading books, watching movies, roller skating or just enjoying a good meal, an interesting conversation or a sunny walk around the neighborhood.